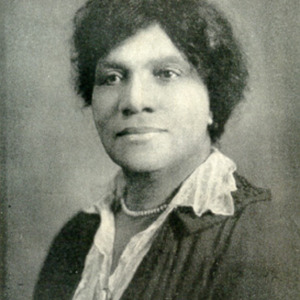 Born and educated in Richmond, Virginia, Adah Belle Samuels Thoms championed equal opportunity for African American women first as a teacher in Virginia and later during her professional nursing career. As President of the Lincoln Hospital Alumnae Association, she hosted the organizational meeting of the National Association of Colored Graduate Nurses in New York City. 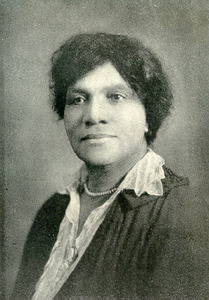 Thoms campaigned for the enrollment of black nurses by the American Red Cross during World War I and was influential in increasing the number of African American nurses in public health nursing positions. "Mrs. Thoms' leadership is significant not only for her own race but for those socially minded person of every race who cherish high purposes and unselfish accomplishments that bring promise of better relationships between people." Lincoln Hospital and Home, New York, New York, Head Nurse, Surgical Ward, 1905; Operating Room Nurse and Supervisor of Surgical Division, 1905-1906; Assistant Superintendent of Nurses, 1906-1923; Served as Acting Director of the School of Nursing for this same period but was never named director because, at that time, African American women were seldom promoted to upper-level positions. Biographical Text: Adah Samuels Thoms was in the forefront of efforts directed toward achieving equal opportunity for women. She was committed to organizations as a way to achieve goals. She organized and served as president for ten years of the Lincoln Hospital Alumnae Association. In that capacity, she invited Martha Franklin, founder of the National Association of Colored Graduate Nurses (NACGN) to hold the first meeting of that Association in New York under the sponsorship of the Alumnae Association. Thoms was a charter member of the NACGN and served as its first treasurer. She was later president and was the first recipient of the Mary Mahoney Award from NACGN. This award later became one of the highest honors bestowed by the American Nurses Association. Thoms campaigned for the enrollment of black nurses by the American Red Cross, the path to the United States Army Nurse Corps. She urged black nurses to enroll in 1917 when war was declared against Germany and refused to accept their rejection because of race. Jane A. Delano, Chairman of the American Red Cross Nursing Service became an ally in this campaign and eventually the Surgeon General agreed to a limited enrollment. The first African American nurses were enrolled in July 1918, but it was not until the height of the flu epidemic in December and after the war was over that 18 black nurses were appointed to the Army Nurse Corps. In 1921, during the NACGN Convention in Washington, D.C., Thoms was received at the White House by President and Mrs. Warren G. Harding. Concerned about ethics in nursing, Thoms encouraged older nurses to work in the development of younger nurses to promote professional ideals. When a movement began to merge the NACGN with the National Medical Association, Thoms was an outspoken critic of the idea. She believed there could be a connection short of merger that would allow nurses to retain their identity. She supported a movement toward the consolidation with the American Nurses Association and the National Organization of Public Health Nurses. Thoms was an original inductee in the American Nurses Association Hall of Fame in 1976. “Adah Belle Samuels Thoms,” VCU Libraries Gallery, accessed April 22, 2019, https://gallery.library.vcu.edu/items/show/77978.